In squad-based games like Apex Legends, players must work as a team in order to triumph. Much of the game’s built around co-operation, be it Ultimates that benefit the whole team, using Smart Comms to communicate with teammates or reviving one another when you’ve taken a barrage of bullets. 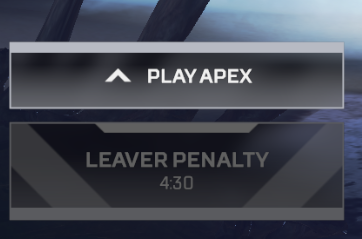 There is a new leaver penalty, if you leave 3 matches in a row before time out or squad wipe, you’ll get a 5 minute penalty and won’t be able to search a match. … It’s likely you can’t avoid it as easy as just 2 in a row and then wait, leaving 3 out of 4 matches should do the same, but right now, 3 in a row triggered it instantly. Honestly, a five-minute time-out is in no way a harsh punishment for this kind of thing, but at least it provides an incentive to players to try their best to work together without dropping. Some folks have already criticized the feature, claiming that being able to quit a game is vital if you end up with a player who just wants to grief his teammates by refusing to revive you after taking your banner or just someone acting like a general moron. But the obvious counter to that is that you can still quit the game (twice even). It’s only if you get into a pattern of doing it that the penalty kicks in. Tell us, though, what do you make of this? Do you agree with Apex Legends‘ new quitting penalty? As always, share your thoughts with us down below.